How love, fresh air and ten dollars yield a 100% ROI, year-on-year. Adjusted for inflation. Yes, there is work to be done. Ensure that the land they have ownership of or access to is workable, accessible and geo-taggable. The farmers or members of the self help group are reliable and are interested in long term continuity. Each tree is tended to properly. Timely and correct use of manure, pesticides if any, pruning and watering is done. We agree, planting a sapling is the easiest thing to do. Every day and every year you can read media reports of a million saplings being planted. Unfortunately after the flash-bulbs and cameras and pen on paper have stopped recording the event, no one goes back to the plantation site. In fact if you ask any of the self help groups that we work with or with a planter or gardener that you know, their answer is always the same. Unless a sapling is nurtured for at least two years, it does not becomes a tree. In fact to start with, planting a sapling is a Carbon negative activity as it entails GHG and CO2 emissions while sprouting, transporting, planting and the initial watering and nurturing process. It takes two years or more before the plant becomes carbon positive, meaning it absorbs more carbon di-oxide than it has caused. Hence if the mortality rate is not kept low, meaning 80% or more of the saplings survive and become trees, the planting activity is in fact adding to our green house gases and hence aiding instead of mitigating global warming and climate change. 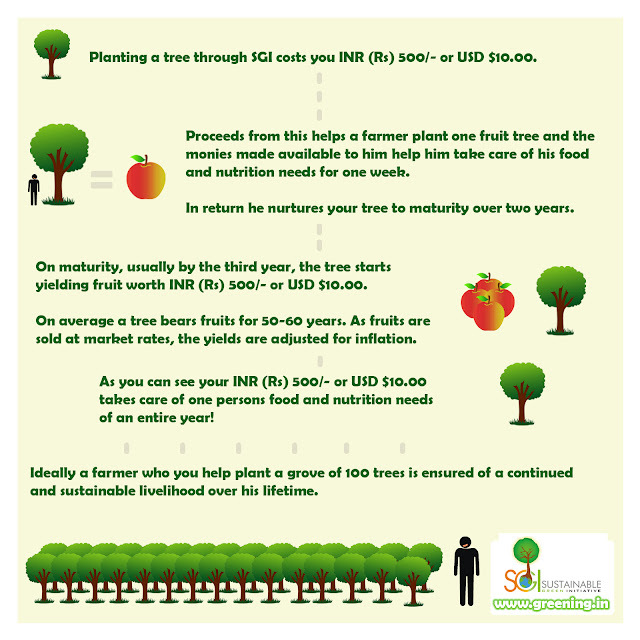 We at Sustainable Green Initiative work with marginal/ bpl farmers to plant fruit trees on land resources that they have access to. And ensure that the plants are nurtured to become trees. Thereby ensuring that your investment not only returns back in value and goes a long way, to mitigate climate change, hunger, poverty and re-ruralization.